That is, taking advantage of the time before bed to organize the following day. The less you have to think about at night, the less you worry about, and the better you can sleep. The better you sleep, the more productive and happier you are, and the more success you will achieve. See why your evenings are just as important for establishing a routine? Whether this is mentally preparing what you will eat the next day or actually making it the day or night before, it means knowing in advance your meal choices for the day. Not rocket science I know, but things as simple as prepping your coffee or kettle the night before, having your kids put out their breakfast (bowl/spoon), packing all lunches, cutting up your veggies for your morning eggs-n-veggies and planning your evening meals. All these efforts save you time, frustration and help you eat better. Some of you already follow a meal plan (woohoo), but there are always things that fall outside of it, like lunch meetings, coffee dates, kids activities, or unexpected guests. By laying out your weekly plan for food, you will escape the “WHAT’S FOR DINNER?” shenanigans that happen when everyone is clawing at you for food at 5:30 pm, especially if you are not prepared. Meal planning does not have to be complicated. You can cycle the same two breakfasts every morning, the same two lunches, and the same four dinners if you need. (If you’re like me and hate cooking, this strategy is the best option! Less worry and less clean up.) And if you have a few extra dollars to spare, you can sign up for healthy meal delivery plans like Territory, HelloFresh, Amazon Meal Kits, and many, many more. Stop drinking caffeinated beverages before noon. Caffeine can stay in your system for up to 8-hours, if not longer, so you need to let that sh*t pass before you hit the hay. Drink tons of water all day, but not within an hour before bed. When you’re body has ample hydration it can process things better: like waste removal, breathing, body temperature, brain function, and more. Your body needs a lot of fluids during sleep for its operating system to run at peak performance. But the key is to not set yourself up for frequent bathroom visits. So you want to make sure you go pee like your kids do, right before you go to sleep. Avoid social media. “Yeah yeah,” you’re probably thinking, but social media actually depresses you. You need to go to bed happy, or else you risk sleep deprivation by way of delayed sleeping and anxiety. Not only that but, as you know, blue lights emitted from your screen mess up your internal clock, forcing your subconscious mind to think “Bright light! Day time! Get up!” which is the last thing you need. Read your 10-pages. To actually get my reading in, I schedule time each night before bed to read 10-pages. It also serves as a trigger for my body to relax and know it’s almost time to sleep. If you have younger kids, using timers can be a huge help. Use timers to help establish and maintain routines for them, and yourself, so that you can get your tasks done. For younger kids. We set three alarms on my phone, 7:00 am, 7:15 am and 7:00 pm. Each alarm reflects a certain critical time of day, either “get to school” or “get to bed!” Using these alarms helps guide their behavior and gets them ready on time. For timers, we use the Miracle Time Cube Timer for things like brushing their teeth, doing certain chores and ‘time-outs.’ When the timer goes off, it indicates a hard stop to the task at hand. This helps to move things along so that they are ready for bed. Put your lights on a timer. I have a Himalayan salt lamp on an outlet timer in my room. It goes on at 5:30 am and then again from 7 - 9 pm, which indicates ‘evening routine time.’ Once the light goes off at night, it means bedtime. Super hack: If you have a TV in your bedroom, plug it into that same outlet timer, so you have no choice but to tune out and turn off. Use a Pomodoro technique. You can install Chrome extensions or use the Miracle Cube as I suggested above. The idea: Start and complete a task or a component of a task in the set time. After the time’s up, stand up, shake it off, and then restart your next task. Big rocks. Ask yourself “what’s the ONE thing I have to do tomorrow to move the needle?” Is your morning set up to achieve it? It all starts with the morning mindset so make sure you are set up for success before you even go to bed. Wake up and only focus on that one task. Fill the empty slots. Sounds silly really, but imagine someone else controlled your calendar and had the liberty to schedule anything they wanted? You’d be anxious and stressed. So take the time to fill in those slots with productive work or tasks. This could mean adding in travel time between meetings, brainstorm time, creative writing hours, etc. The idea is to OWN YOUR CALENDAR. Ever wake up at 1:30 am panicking about something you have to remember to do in the morning? Then you toss and turn for another hour worrying about forgetting it, then you think of something else and then something else? Sounds familiar, doesn’t it? If you often get anxious while trying to fall asleep because the thoughts of the next day worry you, you need to start brain dumping everything into a notebook. Keep a pen and notebook next to your bed. I use Fieldnotes and the Pilot Pen which allows me to quickly jot down the things I recall in the night without having to turn on the light. I keep the notepad out in the night if there is something I wrote on it as a reminder, otherwise, I’ll keep it in my drawer. Write down anything. Whatever is buzzing around your mind, write it down. It does not have to be coherent, or even important...just get it off your mind. It could be a task, an idea, a reminder, or a thought about something that has been bugging you lately. What it is is not as important to actually get it out on to paper. Clean up everything that you can as you start winding down for the evening. Kitchen, living room, laundry, all of it. Yes you are tired, yes you had a busy day, no you don’t want to do this, but it certainly makes it more enjoyable to wake to a clean and tidy house. This especially includes your workspace (if you work from home) and your path to getting the kids out of the house seamlessly in the morning. Is the necessary laundry done Are bags packed? Is the coffee ready to be brewed? Post words of inspiration. On your fridge, your bathroom mirror, behind the bathroom door, on your phone and computer screensaver, wherever you see something the post, print and post some morning motivation for you. Lastly, you need to put your head to rest at the same time every night. Don’t let your routine fluctuate unless you really have to. Your circadian rhythm is a beast to train, and while you know it or not, your body needs a very consistent night routine to use your sleep time for replenishment. Don’t fool yourself into thinking that you can stay up an extra 30 minutes here and there ‘just because.’ Your hard-stop sleep time means everything to your body, whether you like it or not. 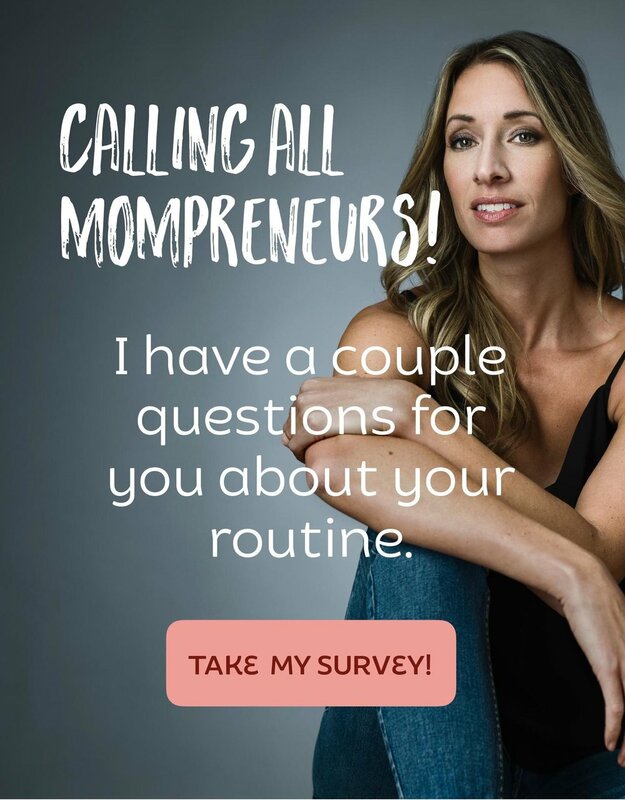 And let’s face it, an extra episode of Breaking Bad is NOT going to make you a more successful mom, entrepreneur or partner the next day. Your evening routine will predict not only how you emotionally start your day, but also the full effectiveness of your time. Having an established night routine compliments anything you do when you first get up and helps to set the course for a great day. Older PostHow This Mompreneur Overcomes Guilt: I gave myself a guilt lobotomy.